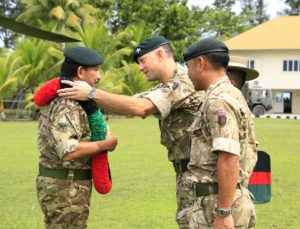 His Majesty, The Sultan of Brunei visited the 1st Battalion, The Royal Gurkha Rifles today to give the Battalion the opportunity to thank His Majesty for their time in Brunei before they return to the UK in August. 1 Royal Gurkha Rifles (RGR), as the Resident Infantry Battalion will be replaced by 2 RGR. His Majesty arrived by helicopter and was welcomed by The Commander, British Forces Brunei, Lieutenant Colonel Charlie Crowe, and The Gurkha Major, Major Shuresh Thapa MVO. They welcomed him in a traditional Gurkha Ceremony by placing a garland of Regimental Colours over His shoulders, before escorting His Majesty into the Garrison Officers’ Mess. HM was welcomed by an Honour Guard, commanded by Captain Ganesh Kumar Gurung, in the Mess garden overlooking the South China Sea. It was a unique occasion for Warrant Officer Class 1, Regimental Sergeant Major Bahadur Buddha Magar, Warrant Officer Class 2 Bel Bahadur Gurung and Warrant Officer Class 2 Simon Macey, who having recently commissioned as late entry officers had the honour of being presented with their new rank slides by His Majesty the Sultan. His Majesty then observed a capability demonstration of a Company Raid Operation, made up of members of the Battalion’s Rifle Companies, and Specialist Weapon Platoons including the Reconnaissance, Sniper, Mortar, Machine Gun and Anti-Tank Platoons. His Majesty moved amongst the fighting troops before watching an extraction onto the beach and out to the sea by Rigid Inflatable Boats provided by the Garrison Boat Section. 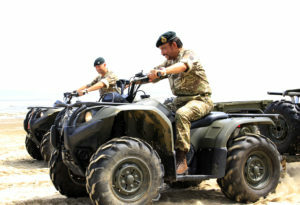 His Majesty was then briefed on 1 RGR’s all-terrain quad bike and had the opportunity to test-drive it on the beach. His Majesty then moved to the Chit Chat Community Centre where he was welcomed by a combined performance of the First Battalion, The Royal Gurkha Rifles and the 3rd Battalion, The Royal Brunei Armed Forces Pipes and Drums. He was met by five young girls in traditional Nepali dress, who welcomed His Majesty with a traditional Nepali welcome known as ‘Pancha Kanya’. 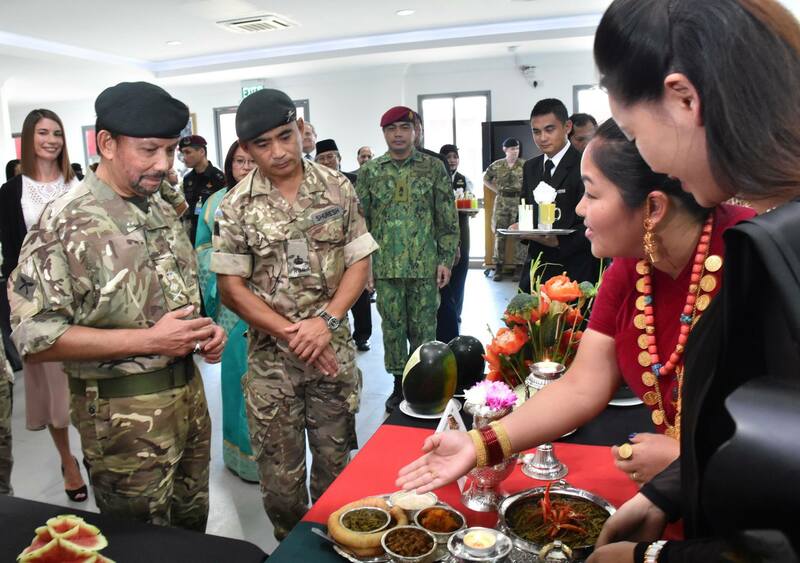 His Majesty then moved into the community centre to meet staff and pupils from Hornbill School, the Battalion’s Hindu Religious Teacher, Pundit Bishma Niraula and members of the Army Welfare Service. 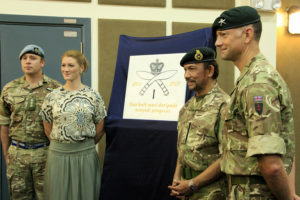 The Commander, British Forces Brunei, Lieutenant Colonel Charlie Crowe thanked His Majesty for his continued support to the Regiment and presented a carved and gilded marble plaque with The Royal Gurkha Rifles’ Cap Badge and carved underneath in Malay, The Regimental Motto. His Majesty then departed to three cheers from all ranks in British Forces Brunei and a rendition of the traditional ‘march-off’ for HM’s Royal Brunei Armed Forces from the combined Pipes and Drums.